Dec 5 This is the fifth in the series of performance articles as part of my 2009 performance advent calendar experiment. Stay tuned for the next articles. Let's talk a but about waterfall optimization - the first thing that happens in Mr.Page's life. The best way to optimize and speed up the waterfall is to have less stuff in it. The fewer page components, the faster the page - simple as that. Why? Because every HTTP request has overhead. OK, but how bad can it be, someone might ask. If you look at an HTTP request - it has a header and a body. A 100K body will greatly outweigh the size of the headers, no matter how bloated they are. P3P: policyref="http://p3p.yahoo.com/w3c/p3p.xml", CP="CAO DSP COR CUR... blah, blah"
This is 352 bytes request header and 495 bytes response header. Not so bad, eh? No matter how hard you try to make your cookies monster-size, the response body (9k gzipped in this case) will always be significantly bigger. So what's the problem with the overhead of the HTTP requests then? The size of the headers is a problem when you make requests for small components - say requests for small icons - for example 1K or under. In this case you exchange 1K headers to get 1K of useful data to present to the user. Clearly a waste. Additionally this 1K of headers can grow once you start writing more cookies. It may very well happen that the HTTP headers size is bigger than the actual icon you need. And even if the headers are not bigger that the component, they are still big when you think percent-wise. 1K of 10K is 10%. But the HTTP headers size is only one (and the smaller) of the problems. The bigger problem is the HTTP connection overhead. What happens (at a high level) when you type a URL and hit Enter? The browser sends a request to the server. Which server? The browser needs to know the IP address of the server, so if it doesn't have it in the cache, it makes a DNS lookup. Than the browser establishes a connection to the server. Then it waits for the first byte of the response from the server. Then it receives the full response (payload). So what do we have here - looks like in this particular case the browser is downloading content about 40% of the time. The rest of the time it's... well, not downloading content. How's that for an overhead. And the part of not downloading can be even greater, this above was just one example. Now how about this - a bird-eye view of the 4 last pages in webpagetest.org's test history - just some random pages people have tested. In fact you may notice that the smaller the component, the smaller is the blue part. A significant chunk of time is spent in activities other than downloading. 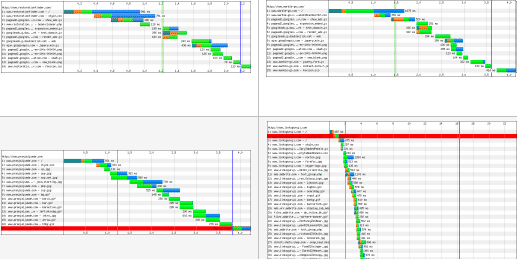 Smaller components still incur HTTP overhead and for them the relative penalty (relative to their size) is atrocious. So what's a performance optimizer to do? Reduce the number of components and so pay fewer penalties. Truth is - a lot of stuff on the pages today is not needed. Features no one likes or uses clutter the page and make it heavier. Well, what can you do, the boss/client/marketing guy wants that feature there. What you can do is at least try. You can introduce some science into the marketing activities - measure how much a specific feature is used. Or if you already have the data - look at it. Decide what can a page go without. It's going to be tough convincing people to remove stuff. After all you spend time developing it. Someone dreamt up that feature initially. Someone (not the users) loves it. People hate to let go. But still, it's worth to try. Sizes, gzipped: 70029 bytes before, 65194 bytes after. Simply merging files and there's even 6.9% saving! Sizes, gzipped: before 14781 bytes, after 13352 bytes, saving 9.6%. But the bigger saving: 4 less HTTP requests. If you wonder how come the sizes before and after are different since we merely concatenate the contents of the files, well, the savings come from gzip compression. When you have more characters in the file, there's more chance that some will repeat which means they will compress better. That's one. And then, the compression itself has an overhead which you incur once for the whole bundle of files, as opposed to for every file. Result size: 1.4K, 7 times smaller! Here the savings are so dramatic partially because the source files are GIFs and the result is a PNG8 but that's a whole other post. So in conclusion: file concatenation is just awesome. You save both: bytes to download and, much more importantly, HTTP requests. Less of the green stuff in the waterfall! So far we combined .js with .js, css with css and images with images. How about a cross-component type concatenation? You can inline images inside HTML and CSS (and why not JS if you want) using data URIs (another post coming). And you can inline CSS and JS inside HTML too. This means you can have your whole application inside of just one HTML file if you wish. Inside of the HTML you have inline styles, scripts and images. Now how about mixing CSS and JS into one component. You can do that, and it's especially suitable for lazy-loaded, widget-type functionality. Say you've loaded the page, then the user clicks some rarely used button. You haven't downloaded that content that is supposed to wow the user upon click of the button. So you send a request to grab it. The new content may come in the form of a JSON string. And what if the new content requires some stylesheet that was not part of the base page? You'll have to make another request to download that stylesheet too. Nice and simple. Makes the features (that progressively enhance the page) atomic and self-contained. Another thing to check is the Keep-Alive setting on your server. Remember how there were 4 steps in the component download. When you request a second component you can have the connection open so that you don't need to re-establish it (skipping step 2). And since the DNS lookup was already made you get rid of step 1. Skipping 2 out of 4 is not bad at all. Reducing the number of page of components is the top priority of any web performance optimization effort. HTTP requests are costly. In part because of the headers size overhead, but mostly because of the connection overhead. The browser spends a disturbing amount of time not downloading stuff, and we can't allow this!